The Belgian and The Aussie: Overlanding a little interesting piece of West Germany. Overlanding a little interesting piece of West Germany. In the past week and a half of travel we have seen some really impressive things. 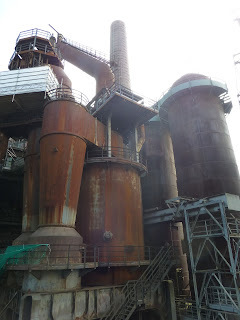 But, for now I will concentrate on a few things we saw in West Germany, near to Luxembourg and a bit of France. I already did a post about the impressive roman ruins in the city of Trier. Just South of there, we visited another 2 roman sites. 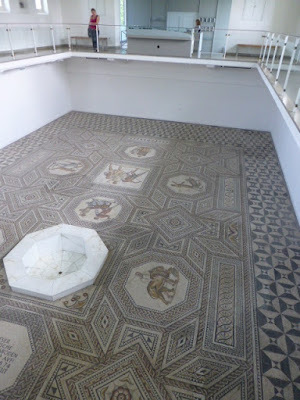 Old was to view some large Roman mosaic flooring. It was most impressive. That site is called “Nennig Roman Villa”, and it’s found in a small town called Nennig. The worst part of it was figuring out how to enter the site. The door was closed and didn’t want to open (not sure if it was locked or just difficult), but someone told us to knock and when we did we were allowed in. Entry was just €1.50 per person, and it is a most impressive mosaic, definitely worth a visit. Next we visited a Roman villa which they have (newly) built to represent how they believe it would have looked 2000 years ago. This place is called “Borg Roman villa Archaeological Park” at Perl-Borg. I was most interested in this place as it provided a sensible alternative to looking at ruins. The place also has a restaurant serving “Roman meals”, which was also interesting. Although this site isn’t riveting I do think that it is worth visiting, and I think it would be fun to be there when they host special re-enactment events. We also visited the Villeroy and Bach ceramics museum…. which I think was probably doing too many sight in one day. I’m sure it could have left a better impression on me, but then, I’m also not really into homewares. The next day we visited another really impressive UNESCO site. 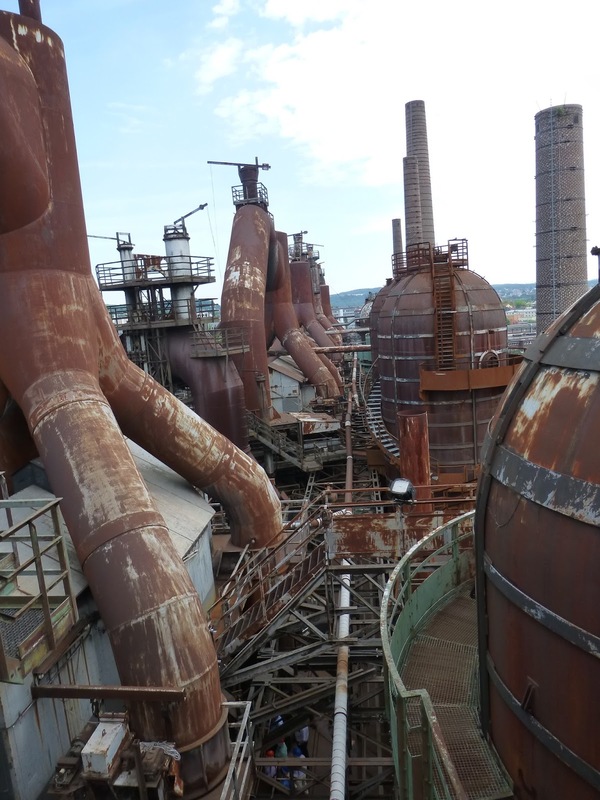 This was an old steel mill, that ceased production in 1986 but at one time employed 17,000 people. 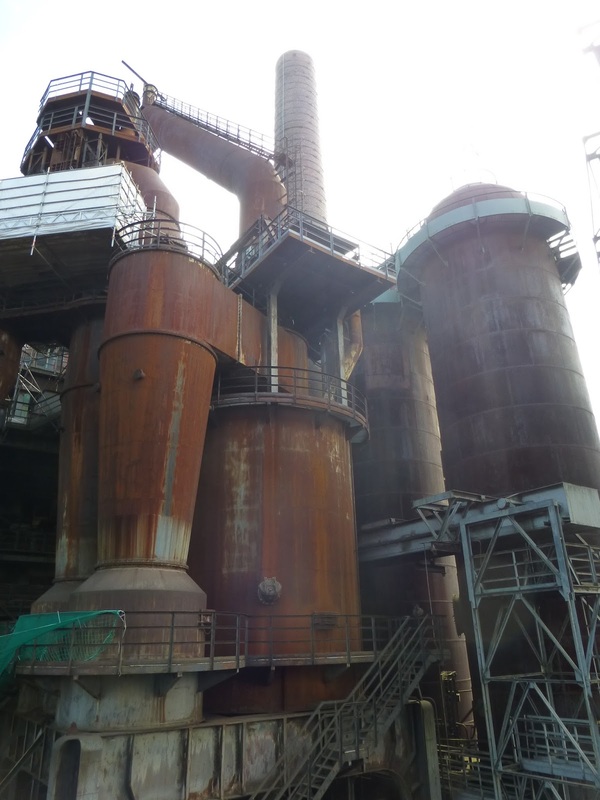 It’s called “Volklingen Ironworks”, and we actually ended up there because the site has free overnight parking for motorhomes. The site was very impressive and interestingly presented. And, another thing that impressed me… the entrance sign said that the ‘tour’ was 7000metres (7km) of walkways, and there were a lot of stairs…. and I carefully did this without pain in my knee! That is a major achievement for me, I’m not fixed yet but I get better every week. Roman mosaic flooring of Nennig Roman villa. Volklingen Ironworks, from outside it's imposing. Labels: europe, germany., overlanding, unesco.